The 1804 silver dollar is always in the news, so it seems. This “King of American Coins” has long been not only one of the most valuable United States coins but also one of the most publicized. This great numismatic rarity surely deserves the attention and acclaim that it receives; after all, just 15 examples are known, and one of those currently holds the all-time auction record of $4.14 million (a record I helped create as an active underbidder at the time of its sale on Aug. 30, 1999). But other early dollars from the very first years of U.S. coinage also are extremely scarce and desirable. And lately, these have been getting some much-deserved attention as well from dealers and collectors who recognize their scarcity and potential. Prices are strong and rising, and there’s good reason to look for sharp growth in interest and performance in the months and years to come. “Early” U.S. dollars generally are considered to be those produced from 1794 through 1804. Actually, all 15 dollars dated 1804 were struck decades later, as researchers have documented in great detail. Dollar production did take place in 1804, but all of the dollars minted that year are thought to have been dated 1803 and possibly 1802. There are three major varieties of these early dollars. * The very first ones issued, in 1794 and part of 1795, bore a “Flowing Hair” portrait of Liberty with a small, rather puny-looking eagle on the reverse. * Partway through production in 1795, the Flowing Hair obverse was replaced by a more polished and matronly “Draped Bust” likeness of Liberty, with the “Small Eagle” reverse being retained. * Then, in 1798, the reverse was changed to a “Heraldic Eagle” portrait – this time with the obverse remaining as it was, with the Draped Bust interpretation of Liberty. This final version continued through the end of the series. Like other early U.S. coins, the Flowing Hair and Draped Bust dollars came in numerous die varieties – more than 100 have been identified – and this reinforces and enhances their appeal to the small but growing number of hobbyists who pursue them. The profusion of die varieties might seem to indicate high production levels, with new dies being needed as old ones wore out from use. On the contrary, the mintages were modest – even minuscule, in some cases, with just 1,758 dollars being made in 1794 and 7,776 in 1797. The dies wore out not because of high volume but because of the stress and strain of making such large coins with the relatively primitive equipment in use at the time. At 39 to 40 millimeters in diameter, these were the largest regular-issue coins ever issued by Uncle Sam. Noted coin dealer-author Q. David Bowers is fond of referring to them as “the dollars of our daddies” – and given their impressive size, they might also be aptly described as the daddies of all dollars. Their unusually large surface area makes it easier for collectors to identify and study the many die varieties they exhibit, and even discover new ones on occasion. Collectors who specialize in smaller-size coins, such as early copper cents and half cents, and particularly dimes and half dimes, might well be jealous of that. The late Walter Breen, a brilliant numismatic researcher, once bemoaned the absence of definitive reference books on early dollars – books that might illuminate the series in the same way Dr. William H. Sheldon did (with Breen’s collaboration and that of Dorothy I. Pascal) in the classic book Penny Whimsy. Bowers made a major contribution to interest in early dollars through the authoritative section on this subject in his magnificent book Silver Dollars & Trade Dollars of the United States, published in 1993. More recently, the series has attracted new interest – and new buying activity – because of the popularity of the “registry” set programs now being conducted by the Professional Coin Grading Service (PCGS) and the Numismatic Guaranty Corporation of America (NGC). These programs, which stimulate competition among collectors to form high-grade sets of certified coins, have created new awareness of just how scarce the early dollars are in all collectible grades, and especially in mint condition. Later silver dollars have attracted large constituencies over the last few decades. Morgan dollars have been among the most widely collected of all U.S. coins. Peace dollars have been extremely popular, too. And even Liberty Seated dollars have had a substantial following. But early dollars have lagged far behind – overlooked and very much underappreciated, considering how much they have to offer. There are understandable reasons for this. One is the sheer rarity of these coins, which has long translated into extremely high prices. Even in higher circulated grades, such as extremely fine, these coins can cost thousands of dollars. In reality, these prices have been bargains, considering how few of these coins survive in the upper grades, particularly mint condition. Then, too, early dollars haven’t benefited from organized hobby activity as early cents and half cents have done, for example, through the membership of specialists in Early American Coppers, a club where they rub shoulders, compare notes and gain insights from such renowned experts as Denis W. Loring. EAC has done a great deal to advance hobby interest in large cents and half cents, but up to now there has been no comparable stimulus for early silver dollars. Besides being expensive, early dollars also can be highly elusive, especially for those who seek to collect them by die varieties. It’s almost impossible to find a dealer who stocks these coins by die varieties; for that matter, it isn’t all that easy to find a dealer who carries a decent stock of early dollars at all. If you pick up a mailer from a large coin company or look at its Web site on your computer, you’re not going to see early dollars listed by specific die varieties. It takes tremendous determination to track down these coins, and considerable financial resources to buy them. Overall, early dollars are far scarcer, more expensive and more elusive than early cents and early half dollars, two series that traditionally have enjoyed greater popularity. For these reasons, they are likely to continue to trail behind these other series in terms of the number of people who collect them. Lately, however, we have seen a significant increase of interest in the series and some really extraordinary price appreciation for nice examples. When I wrote Travers’ Rare Coin Investment Strategy in 1986, I included a section entitled “How to Calculate the Market Premium Factor,” and nothing could be more relevant to the current market status of early silver dollars than the market premium factor. Those who compile price guides have great difficulty determining accurate values for coins of exceptional rarity. The reason is simple: Because they are so rare, and those who own them are reluctant to part with them, these coins change hands infrequently. Months – even years – may pass before certain coins appear in the marketplace. But that doesn’t mean their value is remaining static during that time; on the contrary, they might bring far higher premiums the next time they appear than they did the time before. Price-guide compilers have no way of gauging how much these coins might bring if they were offered for sale, so they have to make educated guesses based upon the most recent sales – which could have been years before. As a result, the price guides are often far off base in their valuation listings for really scarce coins – including some of the early silver dollars. That’s where the market premium factor comes into play. A coin listed in a price guide at, say, $500 might actually be worth $1,000 in terms of the price an actual informed buyer would pay an actual informed seller, with both under no particular pressure to complete the transaction. This higher percentage can be expressed in terms of a market premium factor, or MPF, a concept devised by Maurice Rosen of Plainview, New York, a longtime coin dealer who publishes the award-winning Rosen Numismatic Advisory. In the example given here, the MPF would be 100 percent – the amount by which the real fair market value of $1,000 exceeds the price-guide valuation of $500. The MPF can work in reverse, as well. If a coin listed in the price guide at $500 decreased in value in the marketplace to $250, its MPF would be minus 50 percent. Whether the MPF is positive or negative, it is determined by the same algebraic formula: x over y minus 1 times 100 equals the MPF, with x representing the price required to secure the coin and y being the price guide valuation. What we’ve seen lately is an unbelievable – and positive – market premium factor for early U.S. dollars. Recently, I sold a 1795 Draped Bust dollar (Center Bust) graded Mint State-63 by PCGS for a price approaching six figures. The PCGS Population Report lists no MS-68 examples for this coin, no 66s, five 65s, three 64s, seven 63s, five 62s, three 61s, and no 60s. In AU condition, only three have been graded by the service. This is the kind of coin where you may see just one public sale every few years, and people compiling price guides are forced to scramble to verify unconfirmed trades in order to come up with a meaningful valuation. It can be complicated to establish an accurate value for such coins. The Coin Dealer Newsletter Quarterly lists this particular coin at $47,500 in MS-63. That’s about half what it traded for – and the buyer was pleased to acquire it at that price. 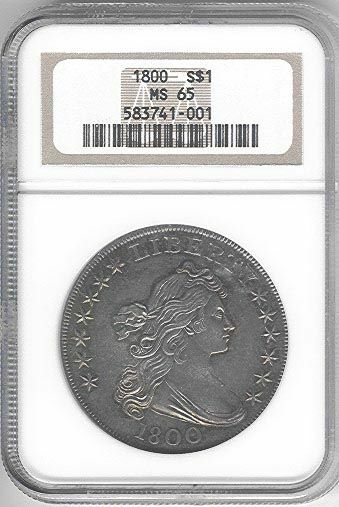 In another recent transaction, I sold a 1795 Flowing Hair dollar of the three-leaves variety – a coin graded Mint State-61 by PCGS – for a price approaching $60,000. The Coin Dealer Newsletter Quarterly lists it at $45,000 in Mint State-63 – two grade levels higher. Once again, the buyer was satisfied, for this is another coin that is difficult to locate and purchase at any price. Further, several other buyers were willing to purchase this coin at the same—or higher—level. There are far more varieties in the first two early dollar types – the Flowing Hair with Small Eagle reverse and the Draped Bust with Small Eagle reverse – than in the third and final type, which mates the Draped Bust with the Heraldic Eagle. In addition, the mintages from 1798 onward, consisting of this third design combination, were generally higher than in the first four years. That’s not to say they’re “common”–far from it. From beginning to end, the early silver dollars present a real challenge, even to those without monetary restrictions. It takes more than money to put together a set of these desirable coins; it takes perseverance, contacts and luck. More collectors are taking the time and trouble to look for these coins today than in the past, and the registry set programs have accelerated this process by sending people scurrying to find high-grade examples of U.S. coins in general – including early dollars. Some of the coins being purchased by these registry-set collectors represent dubious value. It’s questionable, for instance, whether very high-grade examples of fairly common Jefferson nickels are worth four-figure prices. Collectors acquiring mint-state examples of early silver dollars can rest assured, however, that they are obtaining coins of legitimate rarity which may, if anything, be underpriced at current market levels. The 1804 dollar may be hogging the limelight, but the rest of the early dollars constitute a strong supporting cast.